Officer Miller Harvey (Jeremy Allen) is your typical average man living in the early 1940s. WW2 is happening somewhere far away, and maintaining law and order within the small town he lives has just become much more difficult. In the midst of a race riot we never actually get to see onscreen, the small town of Beaumont is placed under martial law. On a hot summer night, attempting to flee the city with his family, Carver Jefferson (Kedrick Brown) is spotted at a roadblock on the outskirts of the city. What follows becomes the bread and butter of "The Example" for the next twenty or so minutes. This random incident between a fleeing black family and two officers of the law. White officers. The fear and loathing of anyone different, and the hard choices that have to be made. Doing the right thing is never easy, and sometimes can even put yourself and family in danger. This fact is shown during the final part of the flick, by way of a note left for officer Harvey. Gordon S Williams makes sure we understand the implications of the time. When standing up for what you know is proper could be a dangerous thing to do. We also get to see the potential effects on the victims of this era past. How a person battles their own demons when they've essentially lost everything. How family takes precedence over anything material, over your own individual life even. How the climb of 'extreme' racism was the very thing that ultimately led to changes. At the same time, this is also a cautionary story. A warning that if things keep on in the world as they are now, nothing good is in store for anyone. All of this is summed up in a quick twenty minute title that is for sure, easy on the eyes. Easy on the eyes and sad for the heart. We've seen this story before. It's nothing really new, but a little less common on the micro budget circuit. 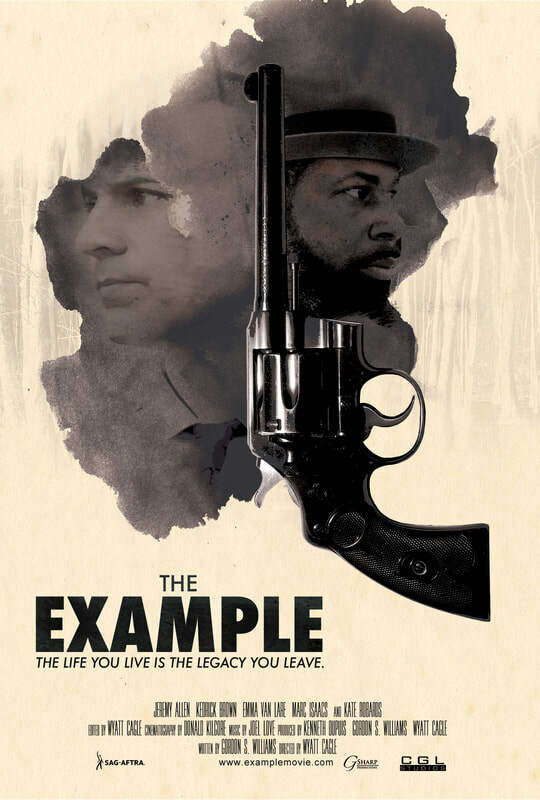 Where "The Example" earns it's marks is with some good writing, some good direction from Wyatt Cagle, and some excellent cinematography from Donald Kilgore. It doesn't hurt that the performances from both the leading cast members, as well as the supporting were all top shelf. Marc Isaacs as Officer Bernard was just as mean spirited - and scared as Kate Robards and Emma Van Lare. The wives to our protagonists, who were strong and wise. "The Example" features no weak links to really write about. Save a slight case of déjà vu with the story. This title far exceeded my expectations in near every way. I should also note that just because this is not a new concept, doesn't mean it wasn't a good one. A good story is just that - and a good production is a good production. "The Example" is a perfect, umm, example, of hard work and talent paying off. This micro title will have no problem standing up to much larger productions, visually. The props, especially the cars, are a definite sign that you're in for something special. Featuring some excellent dialog and a few scenes that totally sold the story, I really can't find any reason not to watch this short flick. Putting all that aside, the message of the film is one most will understand. If it isn't obvious to some, perhaps they should watch again. And again, and again, until it becomes clear. We've included some links below allowing you to connect with this film online. Easily this was time well spent. Well done.